First I would personally like to express the satisfaction for being part of this seminar together with a part of the staff of the institution that I represent, which deals with such an important topic: the election and gender! Secondly, I would like to express appreciation and gratitude to the organizers of this event coming to the aid of the CEC, as well as civil society organizations related to election issues, not “to be self satisfied” with their successes, but to have on the focus of their work, gender equality! All of us share the view that recent amendments to the Electoral Code, recorded the greatest progress in Albanian society strengthening the role of women in political life! Sanctioning with the electoral law that the list of candidates for municipal councils, one in every two consecutive names belong to each gender, marks a great achievement, but not the realization of what Albanian women deserve and aspire. Albanian society accepts it as standard which must be realized. 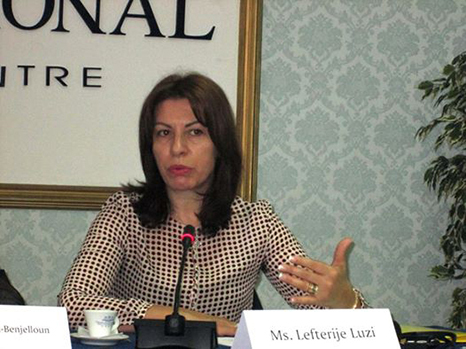 As a woman, and at the same time the head of the institution of the CEC, Igladly affirm that women, who are more than half of the Albanian electorate, successfully faced their next challenge: 50% representation in local councils candidate! This is obviously great achievement, turning my head back to see the engagement of women in political life during the transition of these 25 years of democracy! The reality of the early years of the transition from communism to democracy was accompanied partially by a call to return to the values of ‘traditional’ and radically reduced the representation of women in elected bodies. Adoption of legal quota “for equality in society”, in July 2008, following the Election Code, in December 2008, may call the first milestones where legal guarantees for gender equality in Albanian society start. The reality behind the implementation of these laws proved, along with progress, the existence of strong gender stereotyping, or political will only declared, but in reality missing, which violated the guarantee the law aimed to provide for equal treatment of gender in political representation. The merit for determining 50% quota for local councils,I modestly want to highlight the contribution of the CEC, which, with the support of international partners, brought together opinion, suggestions and aspirations of all stakeholders of the field, and then were sent as proposals for changes to the Electoral Code, in case of an electoral reform. In the multi-name lists of electoral subjects running for council members total 36,251, of whom 17,887 or 49.34% were women, and 18,364 or 50.66% were men. For mayor, 16 candidates or 9.94% are women and 145 candidates or 90.06% are male. Another problem that we need to keep in focus is the empowerment of gender representation at all levels of the election administration with an electoral process sensitive to gender issues and encourage women’s involvement in political processes. Electoral Code, determines the obligation to respect the gender quota 30% only for second tier commissions, and only for two major parties. I gladly affirm that the two main parties in these elections, have exceeded this quota, proposed respectively by 38% and 37% female. Despite this fact, it must be determined that gender quotas for the third level of the election administration, where election statistics of 2013 show that more than half of the polling commissions has been no representation of women. Personally, I believe that increasing women’s participation in local and central government, in parliament, other institutions and election administration, has great influence in changing mentalities and is the most efficient way to educate younger generations, with the right ideas for freedom, gender equality and harmony between the gender.It is the right way to confront gender challenges in Albania. With this aim, the CEC, as up to now, will continue to exercise its role to strengthen efforts for social awareness of electoral and political rights of women.